On Thursday, June 23, 1977, the United States Supreme Court ruled in Jones v. North Carolina Prisoners’ Labor Union, Inc., 433 U.S. 119 (1977), that prison inmates do not have a constitutionally protected right under the First Amendment to organize and join prisoner labor unions. Writing for the majority, Justice William Rehnquist took judicial notice that the inmate union in North Carolina was a glorified outlet for inmate anger designed to foment racial hatred in North Carolina’s prison system. But, history suggest otherwise. The North Carolina Prisoners’ Labor Union (NCPLU), the first prisoner union in the South, not only condemned racial hatred, it actively sought the creation of a pluralist society behind prison walls. Its leadership contained no dangerous criminal element. Instead, educated black power activists, many of whom were imprisoned as an effort to stall their activism, operated it. Absent from the Jones opinion, and the academic discussions that followed, is any mention of the issues proposed in this study – the realities of the Black Power Movement behind prison walls. From Black Power to Prison Power presents a historical analysis of law and race during the Black Power Movement, as well as their import in the Jones decision. 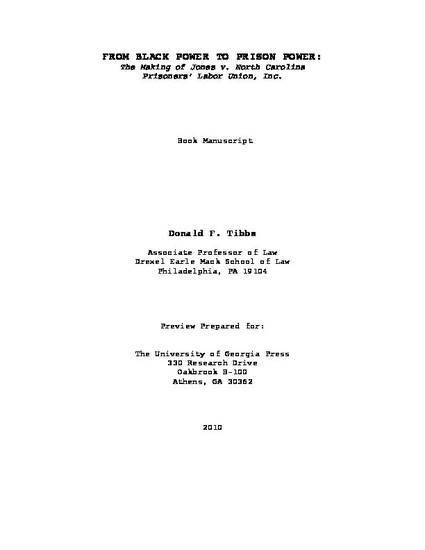 It offers a clearer context for the domestic and international imperatives that characterized prisoners’ rights politics during the Black Power era, and details how social factors, as opposed to the rule of law, galvanized the highest court in the United States to forever alter the course of prisoners’ rights law.